WEG Electric Machinery’s (WEM) brushless excitation system consists of a high frequency AC generator (armature & field) and rotating rectifier bridge. WEM’s brushless excitation system provides high reliability through elimination of brushes, collector rings and carbon dust, which in turn greatly reduces inspection and maintenance costs. Rotating rectifier redundancy with detection of diode failure which in operation allows for more convenient maintenance intervals. 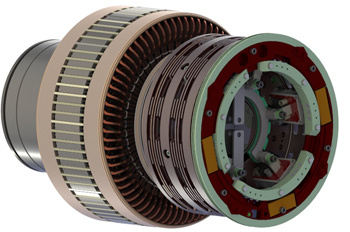 WEM is the industry leader in brushless excitation for 2 pole turbine generators with over 500 units installed. WEM brushless exciters are used by generator manufacturers worldwide to meet brushless requirements.